As political prisoners enter day 14 of the 'Freedom & Dignity' hunger strike they are still being refused their rights and basic needs. Prisoners are being put into solitary confinement, denied legal representation and personal belongings have been confiscated. The prisoners have also reported that salt has been confiscated which they use to consume with water during hunger strike to stop their blood pressure from falling and to avoid rapid lasting damage to the intestines. 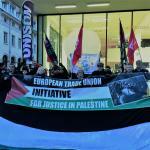 Please see here the latest news on Palestinian solidarity and how to take your own solidarity action! Tomorrow the people of Bardala village, men, women, children, and animals will march to Road 90, the main road in the Jordan Valley, carrying the slogan of ‘Depriving us of Water is a Crime Against Humanity’ and ‘We are Here to Take Back our Water’. 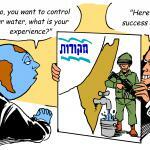 They are determined to fight for the right to water and against Israel’s water apartheid. The Right to Water campaign and the Popular Council to Protect Jordan Valley are calling on the international community to support us in our fight to take back our water. Women in Palestine, as anywhere across the globe, are subjected to and daily resisting an intricate, mutually reinforcing web of state, social, economic and domestic violence and oppression, continuously violating their rights. The burden of Israeli occupation weighs therefore on many more layers on the daily lives of Palestinian woman than their male counterparts. As Palestinian political prisoners enter into the sixth day of their freedom and dignity hunger strike, prisoners are being transferred into solitarily confinement, denied solicitor visits and one hunger striker has taken ill and been transferred to hospital. Tensions are high and Palestinians are calling on the international community to take a stand and hold Israel accountable to their breeches of Human Rights. All this week demonstrations have been taking place across Occupied Palestinian Territories in Beituniya, Bi’lin, Kafr Qaddum, Ramallah, Nablus and Bethlehem. Monday 17th April marked Palestinian prisoners day. As Palestinians remember their friends and relatives who have been detained at the hands of the Israeli state, over one thousand Palestinian prisoners began a mass hunger strike - the largest in recent years. 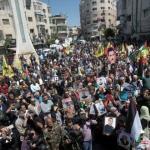 The hunger strike was called by prominent political prisoner Marwan Barghouti and is supported by most Palestinian political factions and protests all over the West Bank. 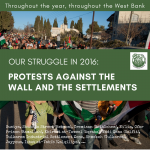 2016 has seen two important – and victorious – labour struggles in the settlement factories in Tulkarem. This article tells their story and gives the background of systematic exploitation and oppression of the workers by the Israeli apartheid system and its industries. We are tell below about the ongoing struggle of the Palestinian workers, especially in the Tulkarem settlement industrial zone, and outline the initial destruction of the Palestinian agricultural sector in the region and the exploitation of the surplus labour created in this manner. The ‘settlement law’ adopted by the Israeli parliament this week legalises apartheid rule over Palestinians. 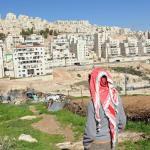 By itself, the law passed on Monday will not substantially change the day-to-day reality of the Palestinian struggle. It’s a piece of legislation that simply adapts legal strategies used since 1948 to dispossess Palestinians of their land. What the law does, however, is significantly alter Israel’s legal relationship with the Palestinians under its military control in the West Bank. At the beginning of last week, Israeli forces have once again targeted heavily Palestinian Bedouin communities throughout the territory they control. In Um al-Hiran, in the Naqab, the demolitions have lead to the killing of a local school teacher and many injuries. In the Jordan Valley, in Khirbet at-Tawil, Israel continued its almost daily attacks against the Bedouin communities and villages located in Area C. Both cases attest to the cruel ethnic cleansing policy Israel is pursuing against the Palestinian Bedouin on both sides of the Green Line. The Land Defense Coalition, officially founded in 2014 as a collective effort of a dozen Palestinian grassroots organizations, has during the last year organized ongoing campaigns, protests and actions to defend the rights of the Palestinian people against Israeli occupation, colonialism and apartheid as well as against neoliberal policies promoted by the Palestinian authorities, which effectively weaken the capacity of the Palestinian people to resist Israeli violations of their rights. During the last court hearing for Salah Khawaja, his defense successfully challenged the trumped up charges brought against him. At that stage, the prosecution of the Israeli military court resorted to presenting a ‘secret file’ to ask for continued imprisonment of Salah. The judge adjourned the proceedings and suspended his decision until a further hearing. Uptodate the court has not announced any date for further hearing, while continuing to keep Salah Khawaja in pre-trial detention. 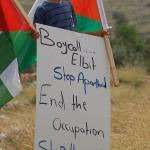 Elbit Systems looses second contract in 12 months in France! BDS France has been able to celebrate yet another commercial failure of Elbit Systems as the French Ministry of Defense has rejected the second offer by the Israeli company in less than a year. This shows how military embargo efforts can be effective even in complicated environments such as France. Please read here the press release by BDS France. Fidel Castro’s passing has been for many a moment of reflection on Cuba’s past and present. 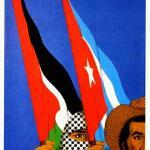 In this article published by the Afro-Middle East Centre, we revisit the Cuban revolution’s contributions to peoples’ struggles across the globe and to the Palestinian people in particular. As many movements around the world are grappling to understand, redefine and practice contemporary and effective forms of internationalism and solidarity, a look at this history and at present-day efforts may help to identify new inputs to shape global connections among peoples. The Israeli military court at Ofar detention facility postponed Salah Khawaja's hearing for one week. Salah, 46 years old, has been arrested in the middle of the night of October 26 and is since then in Israeli jail. He is a human rights defender who started his fight in his village Nil’in, is a member of the coordination committee of Stop the Wall Campaign and is part of the secretariat of the Boycott National Committee. Currently, he is also a leader of the Palestinian National Initiative party (PNI, known as Al Mubadara). UN Special Rapporteur on the OPT, Michael Lynk, and the UN Special Rapporteur on human rights defenders, Michel Forst, have issued a statement denouncing that human rights activists in the occupied Palestinian territories face "daily violations of some of the most fundamental protections afforded by international human rights and humanitarian laws". The statement has been also endorsed by Mr. Roland Adjovi, Chair-Rapporteur of the Working Group on Arbitrary Detention, Mr. David Kaye, Special Rapporteur on freedom of opinion and expression, and Mr. Maina Kiai, Special Rapporteur on the rights to freedom of peaceful assembly and of association. Israeli policies of holding military trainings in the middle of populated areas is Israel continues and has once again cost farmers their livelihoods. 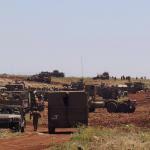 Every year the military organizes large scale military training on the land of the Palestinian farmers in the northern part of Jordan Valley. Usually these trainings take place during the summer, when the farmers are about to harvest their crops, but this time they started training at the beginning of the winter, when the farmers prepare the land for cultivation and plant the seeds. This means planting can’t happen and people will have nothing to harvest in the coming season. Still the Israeli military courts have not decided on the case of Salah Khawaja. As well today the case has been adjourned, this time until December 20. This will bring Salah's incarceration to almost two months. Please help us to keep up the pressure! 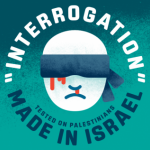 Write to your government representatives and diplomatic missions in Palestine now to ask their intervention to stop Israeli repression of Palestinian human rights defenders. Yesterday, the Israeli military court once again refused to decide on Salah Khawaja’s case, extending with this his arrest until the next court hearing, set for Thursday December 15 at 11 am at Ofar military detention facility. At the court hearing held on December 1 at Ofar detentino facility, the Israeli military court decided to postpone its decision on Salah Khawaja's case to a final hearing on December 11. The court hearing has seen significant presence of consular and international observers. It is the moment to intensify our pressure on Israel to uphold the rights of human rights defenders and due process in its trials. Please keep contacting your governments to intervene with Israel. Yesterday the appeal hearing adjourned from Sunday has upheld the 9 days extension of the interogation period for Salah Khawaja. A next court hearing is scheduled for Thursday, December 1 2016 at Ofar detention center, close to Ramallah. When a true hero dies sadness is overpowered by a sense of gratitude and responsibility. Fidel Castro’s passing away leaves all those of us convinced that justice, freedom and equality are possible with these revolutionary emotions. Our gratitude goes to his commitment to the struggle and courage to attempt almost impossible feats. Another case of Israeli repression of Palestinian human rights defenders - Latest: November 23, the Israeli military court extended the interrogation period for Salah Khawaja for 9 days. Upcoming court hearing appealing the decision: November 27, 16h at Ofar military detention facility. For more see the fully updated dossier here. Three solidarity protests have already been held in the West Bank and Gaza demanding Salah’s immediate release while foreign ministries are briefed about his case and pressured to act. Read here to learn more and see what you can do.